OLF Elementary school hosted their annual Halloween Carnival on Saturday, October 22nd. On a perfect fall day, a large crowd of students from Fatima and local schools, parents, faculty, and friends came to enjoy the Halloween Carnival. This year’s event featured games, carnival rides, costume contests, talent show, music, and great food. Ashley Ross, President of PTO, and the PTO committee put together this event. Ms. Cindy Hahn, Principal, said “this is a special day for the parents, faculty and the local community to work together and for the children to have some fun. The talent show and the costume contest allow our students to display their creative side”. See more pictures from this event in Seen & Heard. A video from the Halloween Carnival is also available on our YouTube channel. 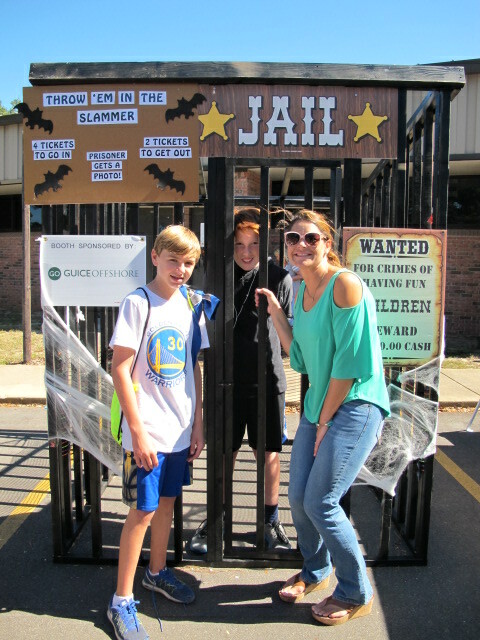 6th Grade Teacher Ms. Moak and Austin Lee “lock up” Beau Muller.